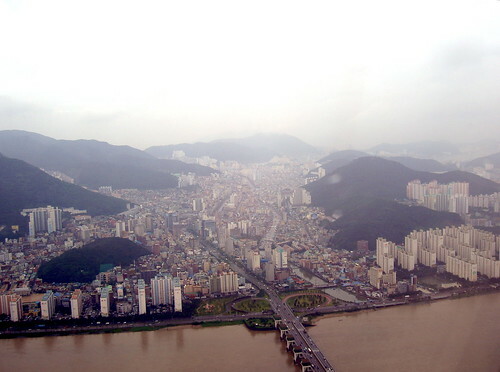 Busan is the second biggest city in South Korea with population of 3.7 million people. 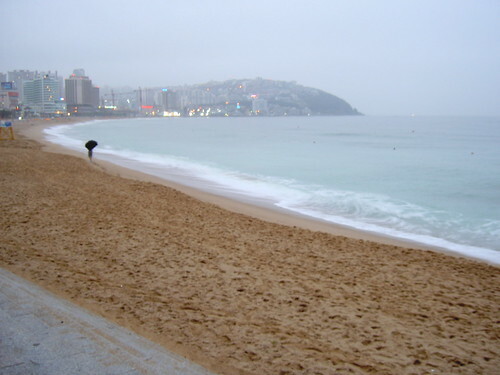 Busan is also a sister city of Vancouver. After work, we were invited for dinner, the traditional Korean palace cuisine. This type of cuisine is getting more popular in Japan. It’s because a drama called “Jewel in the Palace” which showed the life style of a Korean dynasty 500 years ago. This drama recorded 58% of audience rate in Korea and got popular in Japan as well. This cuisine brings so many dishes on the table. I had 20 kinds of dishes. We had lots of Korean soju. 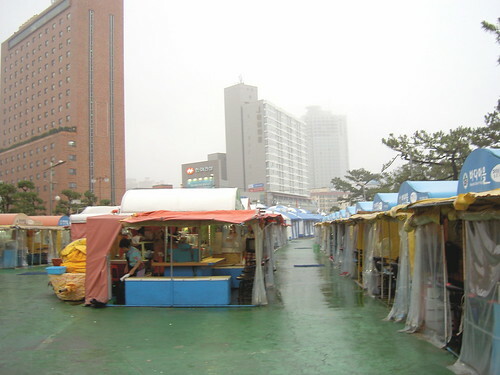 Chuk (porridge): There are many kinds of porridge in Korea. Apparently there are 40 kinds. I had the “pumpkin porridge” which had light sweetness. Gujeolpan (nine-sectioned dish)： This royal dish consists of 8 varieties of food all chopped finely, seasoned, and cooked. They are placed separately in the nine-sectioned platter with a wheat pancake located in the center. Take a wheat pancake and place a small amount of the 8 varieties of food on the pancake. Then simply role up and enjoy this scrumptious dish with a bit of sauce. Japchae (also spelled jabchae or chapchae): is made from cellophane noodles(called dang myeon), stir fried in sesame oil with sliced beef and various vegetables (typically thinly-sliced carrots, onion, spinach, and mushrooms), flavored with soy sauce, and sweetened with sugar. Honey & Ginseng, Ginko fruit and walnuts: Ginseng which was grown for 6 years are sliced and served with honey. Dip the ginseng into honey. Hongeohoe (the sliced fish which is on the top of the photo): is fermented skate fish sashimi. The local ones have strong ammonia smell and the more fermented the more fish meat becomes soft and delicious. Due to this ammonia smell many foreigners become awkward to eat but it’s one of the Korean delicacies. I have seen a documentary about how to make this Hongeohoe and I wanted to try it. I had it with roasted pork and found it quite delicious. Galbi or kalbi is made from beef short ribs, though it can also be made with pork ribs. The ribs are marinated in a sauce made from fruit juice (generally Asian pear juice), rice wine, soy sauce, garlic, sesame seed oil and sugar. Most recipes contain these basic ingredients, although many variations exist, including clear marinades and spicier marinades. The best one was the last one which was soy sauce pickled raw crab. I was told to put rice into the egg shell part. The crab was sweet like raw shrimp and rice with crab eggs was splendid. I had an amazing feast and felt as if I were an emperor. My co-working dudes were happily drunk with Korean soju (rice wine) and disapeared into the darkness where Korean beauties were waiting.I got up at 4 in the early morning and walked around the Haeunda beach. 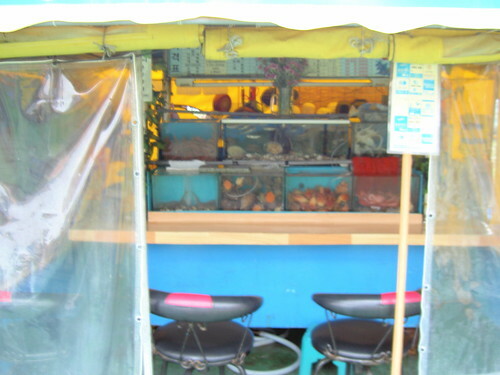 There were many stalls where you can eat seafood over drinks. I imagine it would be fun to come here in the evenings. Next is my visit to Japan after 6 years. After one hour walk I headed to the airport by an airport bus. This entry was posted in REPUBLIC OF KOREA, Travel. Bookmark the permalink.